She had a hard time finding them in Japan, but alas – at the airport, she struck gold green! She gave us the big size version too. Yummy!!!! Wouldn’t you just like to have a bite?! One of the best things about the holiday season…the return of one of my favorite drinks…egg nog! Now, egg nog is a hate or love it kind of thing. For me, it’s a bit of both. I love the creamy sweet taste, but I hate how ridiculously fattening it is. 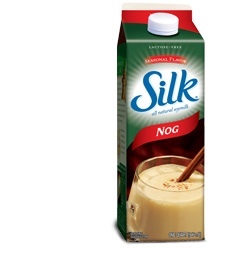 This year, i stumbled upon the perfect thing….soy milk egg nog. It’s delicious! It doesn’t have the same creaminess as regular egg nog, but what you save in calories and fat is totally worth the tradeoff. In fact, soy nog is dairy-free, cholestrol-free, and lactose-free. Thus, you still can get your calcium. They also make a pretty good chocolate mint flavor soy milk and a pumpkin spice (which I haven’t tried yet). Give it a whirl this holiday season! They’ve somehow managed to stay in business over the years – perhaps because they make great white elephant gifts. I mean, how could I pass this one up? It’s the Fremont Troll!!!! I totally bought this for a holiday party. Well, there’s another purpose of chia seeds that Micah and I learned about from our friends. You can eat them. Sure, it’s a seed, so it must be edible. But I honestly never thought about eating them, nor possessed a desire to do so. But we learned that chia seeds have been around for A LOOOONG time, and are incredibly healthy. You just need to sprinkle a spoonful onto your food, or stir it up in some juice – and there you go. They are an excellent source of Omega-3 (apparently more so than salmon), as well as a slew of other benefits. And they can be eaten in seed form rather than ground up like flax seed. When the chia seeds come in contact with a liquid, they start to form a funny “gel” like texture. I’m not a huge fan of that, and they tend to get stuck in your teeth – but despite those drawbacks…I have been adding chia to my oatmeal in the mornings. I figure, a little extra health punch will do me some good. Cha-cha-chia! Happy healthy eatings! I am always down for a good potluck, and how could I refuse this ultimate of potlucks…Crock Pot style?! The premise is simple – whatever you bring has to have been made in a crock pot. YUMMY! The one on the top is a Taiwanese pork soup with bok choy and tea eggs (hard-boiled) made by Jodie. The pot on the bottom holds a spicy meatball filling – that went with yummy soft bread buns and cheese. Jessica made this one. Mike made a coca-cola chicken dish. A few simple ingredients…and a really delish dish. And I opted for a Chicken Tikka Masala dish. It’s incredibly easy to make (as long as you have all the ingredients) and was super tasty. It let me use some of my still massive bag of garam masala! For reasons long forgotten, I decided to plan a hot dog challenge – cooking, not eating. Ew. Joey Chestnut is the current hot dog eating record holder at 68 entire hot dogs. My contest was about creativity. Who could make the most tasty, creative, and unique hot dog? The rules were simple: anything goes, so long as the essence of a hot dog was preserved. Specifically, it needed to have something in a “bun.” But interpretation of that was entirely up to the maker. Tarah, me, and Micah holding up our awesome entries. Tarah and her “Jumba fiyah” hot dog. It was a vegetarian spicy jumbalaya, put into a wheat bun. Micah and his chili and rice hot dog. It was a hotdog topped with his homemade chili, all in a bun made out of rice. Anthony and his pigs in a blanket hot dog. It was a hotdog (complete with ketchup, mustard, and relish) in a bun, and then wrapped in bacon and cooked in the oven. And my entries. Yep, I had two. One was my vegetarian cobb salad, hold the salad, hot dog. It was a spicy veggie dog inside a toasted garlic bread bun (Vietnamese banh mi bun), topped with lettuce, tomato, and deep fried breaded avocado pieces – topped with ranch dressing. My other entry was a chicken jalapeno cheddar hot dog. It was a jalapeno chicken dog wrapped in smoky bacon and deep fried. (That’s right). I made my own cheddar jalapeno hot dog bun. I also topped it with a homemade smoky ketchup and cream cheese (to counterbalance all the heat and spice). Our friends Charissa and Gabe. They even created a rubric in which to judge the dogs. The main categories of scoring: taste, presentation, and creativity. There were also bonus points for most creative name. It was a difficult competition to judge, as well as a lot of hotdogs to eat. At one point, the security guy in their apartment building was brought into break a 3rd place tie. Part of the judging included time where contestants could plea their case hot dog. Micah and his chili rice dog! His prize was some chocolate milk. Given that I was on my no sweets challenge…I didn’t get to enjoy any of it. Mmm…chocolate milk. It does a hot dog body good. Tarah and her Jumba fiyah dog! The security guard felt this one was best overall taste. Her awesome prize…a half used gift card for The Cheesecake Factory. Hilarious! My veggie cobb salad dog!! Woo hoo!! It had best overall presentation. My awesome first place prize…a new pack of gum, and a free drink at the bar (where we headed later that night). LOVED the creative prizes! Plus, I inherited this awesome beer necklace – it even lights up!! We had so much fun – and it’s spurred other competition ideas…hamburgers, vegetarian.